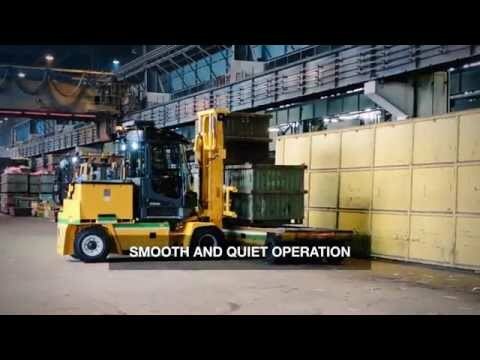 With our latest-generation electric forklift trucks, you get the best of both worlds – all the performance of a powerful diesel truck but without the emissions, noise and vibration. The Kalmar ECG50–90 is a sound investment that can pay itself back in just two years, thanks to its high operational efficiency, low maintenance costs and long service life. Smart and speedy, it features a time-saving diagnostic system, easy maintenance and our fully adjustable EGO cabin with industry-leading ergonomics. Can you afford not to choose Kalmar? Whatever business you are in , you need to take a life cycle perspective on your investment. Our latest generation of electric forklifts, the Kalmar ECG50–90 offers optimum battery usage for up to 15 per cent longer operational time than previous-generation trucks. It also boasts a market-leading diagnostic system that boosts your uptime, and easy maintenance. Compared to a diesel truck the energy savings alone is 75% less with an electric truck. This makes the truck a very attractive investment for the future. For operators, the Kalmar EGO cabin provides industry-leading ergonomics and perfect visibility right around around the machine. The cabin setup can be fine-tuned for optimal operator position and the best possible performance, while the highly responsive hydraulic system improves both precision and the overall driving experience. The powerful climate control makes it just as comfortable on a hot summer day as a cold winters night. The maintenance cost of a electric forklift is significally lower then for a diesel truck, due to less moving parts such as start motor,turbo etc. Comparisions shows that the diffrence can be as much as 50%. Our new electric forklift is also equipped with our latest electric system for fast diagnostics and accurate troubleshooting. With its high operational efficiency, low maintenance costs and long service life, the Kalmar ECG50–90 provides market-leading total cost of ownership and can break even in as little as two years*. and electricity use of 17 kWh per hour at 0.12 €/hour. One day you might need speed to get things done quickly. The next you might need to normal driving. Eco mode cuts energy consumption by up to 15 per cent compared to previous-generation models. Driving the ECG50–90 is a smooth and quiet experience, with no vibration and very low noise levels, making it the perfect choice for indoor lifting operations. Our latest diagnostic system detects faults and automatically displays an error code on the operator’s display, so operators can take instant action instead of spending time on troubleshooting. If a service technician needs to be called in, repairs are faster and downtime shorter because the technician can source the relevant spares in advance based on the diagnostic data. Safety has always been a Kalmar trademark, and the ECG50–90 is no exception. The ECG50–90 has been tested in the though Swedish winter conditions. It works just as well for outdoor operations as indoor operations. No more emission affecting the environment our your personel. The ECG50-90 is completly free from fossil fuel emission and is the perfect chioice for both indoor and outdoor operations or handling of sensitive cargo. Keeping your battery clean and in top condition is crucial for a safe and reliable operation. The latest generation of electric forklifts from Kalmar i equipped with a battery cover that always follows the machine and is easy to even for on person. All service points can be easily reached from a standing position, and the initial 50-hour service of previous-generation machines has been replaced by a 500-hour service.